My bike is gone. A silver Specialized Crossroads hybrid that I got my junior year of high school. It accompanied me to college and spent six years with me on the hilly streets of DC. I loved that old thing. A few years ago I did consider getting another bike. I test rode some pretty fancy things, but it never seemed worth the money. Besides, I had perfected the bike for commuting around D.C. My bike had a collapsible basket and a Jandd Commuter Messenger Bag. I did give another thought to getting a new bike once I arrived here in NOLA. My Specialized didn’t have a shock system and so it clanked along New Orleans’ uneven streets. On the really bad streets the ride was so shaky, it felt like I was traveling on a gravel road. But I don’t have a full-time job, so a new bike would be a luxury. Here is the bike in DC, with me demonstrating my luggage system. Last Thursday I spent the workday over at Fair Grinds Coffee, in Bayou St. John. It rained throughout the day, and when I went to leave I couldn’t unlock the U-lock. It was an old lock, and it had grown increasingly difficult to unlock following a downpour. I guess I should’ve fixed it up with some WD-40, but I just added “buy new bike lock,” to an ever increasing list of things to do. I left my bike at the coffee shop overnight–something I had done dozens of times before, in cities where bike theft is rampant. And you know how the story ends. I still can’t believe it. 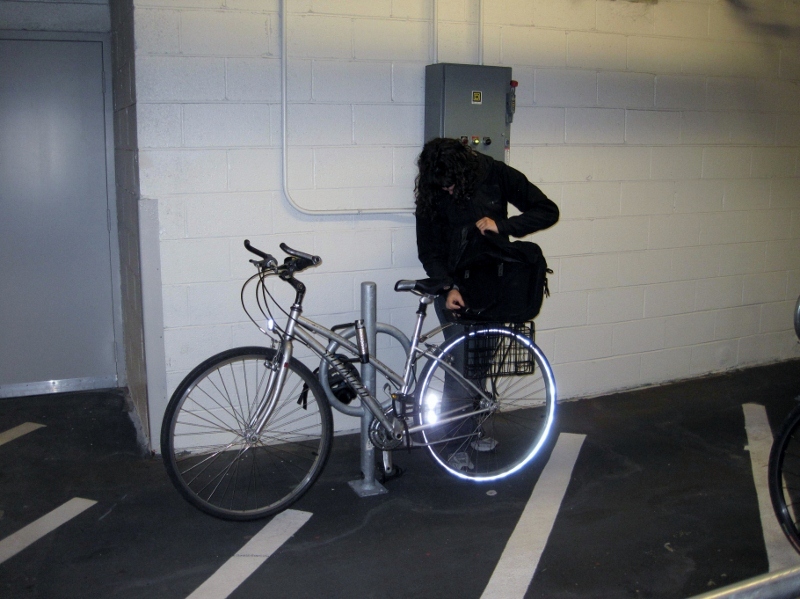 I left my bike outside dozens of times in Gainesville and DC– two cities known for bike thievery. Sigh. Do I Need a New Bike? I have a car. I brought my bike down in August and have been determined to use it. And I have been! Not exclusively, but for getting around Mid City and for some leisure rides–something I never did in D.C. But I don’t NEED it. Should I just buy something really cheap and deal with it until I have more money? In the handful of days since this happened, I’ve already had some skeevy Craigslist experiences and it doesn’t seem like I can get a used bike at a bike store for less than $150. Yesterday, I visited Bicycle Michael’s and Gerkin’s Bike Shop, where I spoke with Alex, who was very nice and helpful. This week I’ll check out Bayou Bicycles, GNO Cyclery and Nobs, where my boyfriend got a used bike in August for $200. But $200 still makes me cautious! Plus, I’ll have to buy a new lock, which can be around $50. Plan B, in the Marigny, is a DIY bike collective where you can learn how to build a bike from scratch. I think you buy the parts from them. I would love to do this because then I’d know exactly how my bike worked. Plus, I’d feel really cool. However, it looks like their build a bike classes are booked until November! Guess I’ll drive down there.